Operational since September 2015, Shannon Chamber Skillnet is now recognised as a very credible training network in the greater Shannon area and by its lead organisation, Skillnets, resulting in it being allocated funding to deliver an even more comprehensive programme in 2018. In its first two years of operation – September 2015 to December 2017 – the Network has delivered 91 training programmes to 889 executives in 322 member companies, and provided training to 45 unemployed people, exceeding its targets for member company engagement. Welcoming the funding approval, Shannon Chamber CEO Helen Downes said: “We are delighted that our application to continue as a training network and to enhance our offerings to members has been approved by Skillnets. “Having a Skillnet has greatly enhanced our offering to our membership. The programmes we have offered to date have reflected our members’ needs, which were identified through a training needs analysis survey issued to all members. Getting members directly involved in choosing the types of training they need means that the impact of all training is quantifiable, and we can assess how it equips employees with the types of new and enhanced skills they need to add value to their organisations. “Our network manager, Cillian Griffey, maintains a constant two-way communication process and an open-door policy with members to ensure that we get accurate feedback on the value of the training we offer. “In assessing which elements to include in our 2018 programme, we took account of the range of sectors in our catchment area and the contribution each programme would make to building the skills of the region. We also keep ourselves fully conversant with new developments in various sectors which enables us to readily assess new training requirements. “Whilst retaining programmes that are in high demand, such as computer skills, sales, customer service, project management, emotional intelligence, time management and leadership skills, we will also have several new offerings in 2018, for example, Lean Six Sigma, GDPR, peer-to-peer learning, internal auditing, strategic leadership, a management development programme, and a training and development seminar. We are putting the structures in place now for a full programme roll-out in early January. “All programmes will be open to a wide range of staff at many levels in an organisation, will lead to efficiencies in processes and a resulting financial gain, will inject innovation into companies’ operations and will reduce employee turnover due to a demonstrable commitment by companies to providing relevant training with personal gain to the individual employee. “Companies today are increasingly aware of the positive impact their providing training can have on retaining and attracting staff. It’s an investment in people and the fact that a company is prepared to invest in training can often be the trigger that attracts new talent to that organisation and, once there, they are more inclined to stay longer,” Ms Downes added. 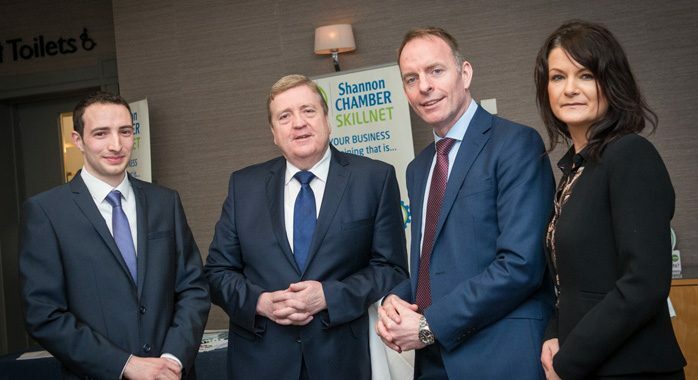 Shannon Chamber Skillnet is one of 64 learning networks established nationally by Skillnets to support and work with businesses in Ireland and their employees to address their current and future skills needs.